Disclosure: I received product from HERSHEY’S and a stipend from Global Influence for this post. All opinions remain my own. My family has weird Easter traditions. My grandparents have been wintering in Florida for at least a decade now. Their return is generally sometime in April, which oftentimes means they’re still away when Easter falls. Not wanting them to feel left out, my mom started a new tradition 6 or so years ago: Fake Easter. Or Feaster, for short. Feaster generally falls 1-3 weeks after Easter and is a time when my entire family gathers, welcoming my grandparents home for the summer. When I say entire family, I mean my parents, my siblings, their spouses, their kids, my aunts and uncles, cousins, their kids… Close to 40 of us, all together. It’s a big occasion. Yup, nearly 40 people gather in my parents’ home for antipasto and ham, mashed taters and green bean casserole, and lots and lots of dessert. My generation is usually in charge of that and we do it justice quite well. Cake, cookies, pies, and rice crispy treats–because Great Grandma always brought them. The feast goes on and on. It is Feaster, after all. Later comes the Easter egg hunt. When we were kids, our parents were less inventive–on Easter morn, we were greeted with baskets laid out on the hearth, overflowing with goodies. Now, they devise elaborate egg hunts in the yard for the grandkids, with tons and tons of loot. Stuffed animals for the little ones, art supplies for the older ones, and lots and lots of candy. 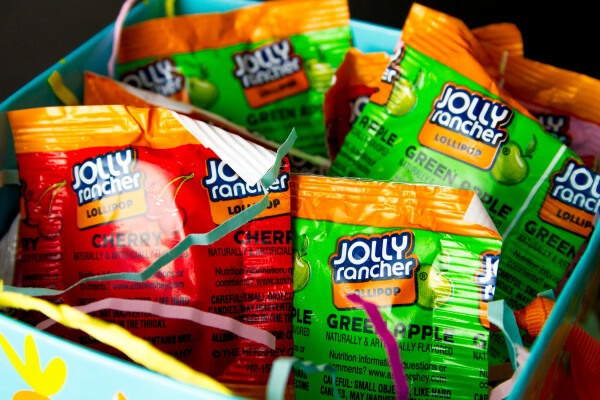 It’s just not Easter without candy. 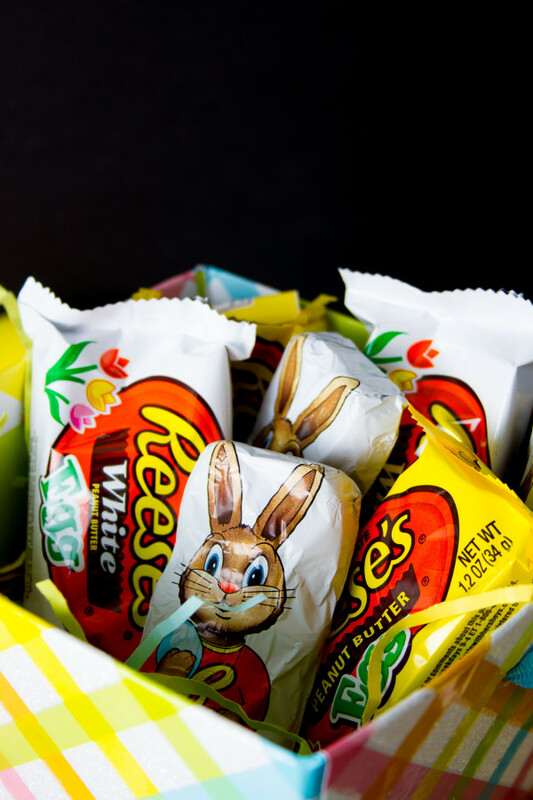 My favorite has always been REESE’S peanut butter eggs. Sure, the CADBURY Creme Eggs are pretty awesome, and their hard-shelled cousins are even better. 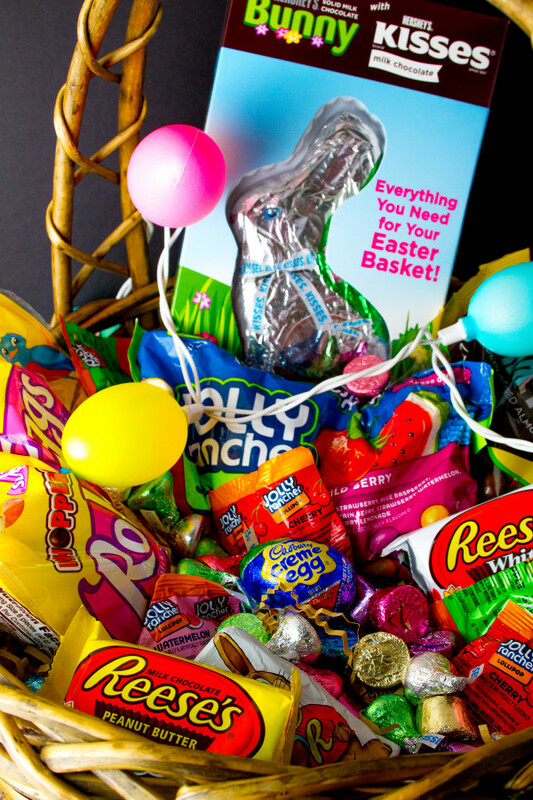 It wouldn’t be Easter without a chocolate bunny in the basket. But give me all the peanut butter eggs and I’ll be a happy girl. THAT is the best flavor combination of all. Just don’t tell my kids that’s where their eggs have gone. As far as they’re concerned, they already ate them and forgot. When I was asked to develop an Easter recipe featuring HERSHEY’S candy, I knew it had to have REESE’S Peanut Butter Eggs. It was only natural! And that’s where Chocolate Truffle Peanut Butter Egg Easter Pie came from. You only need a small slice, it’s just so rich and chocolatey, tempered by lightly-sweetened whipped cream and dreamy peanut butter. This is an awakening on a plate! Amazing! And now, the recipe. Because I know you want your chocolate fix! Hoppy Easter! May your day be as sweet as can be! 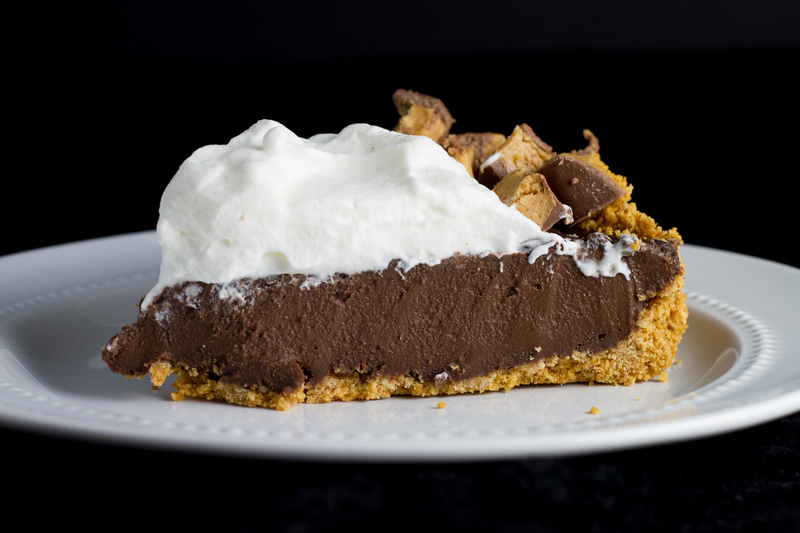 A very rich pie that is sure to please anyone with a chocolate craving. Preheat oven to 350 degrees Fahrenheit. Get out a 10-inch pie plate and set aside. In a large mixing bowl, microwave the butter for 1 minute, or until melted. Stir in the graham cracker crumbs with a fork until evenly coated, then press into the bottom and up the sides of the pie plate. Bake for 8-10 minutes, or until the crust has browned slightly. Set aside to cool. In a large mixing bowl, whisk together the brown sugar, corn starch, and salt. Set aside. In a 3-quart heavy-bottomed saucepan, combine the chocolate, milk, and cream for the filling. Cook over medium heat, stirring constantly so the chocolate doesn’t burn. Once the chocolate has melted, whisk in the sugar mixture, continuing to heat until the mixture thickens and looks like pudding. Remove from heat and slowly add the egg yolks, whisking the whole time to keep the yolks from scrambling. Transfer filling to crust and spread evenly. Cool in the refrigerator for at least 3 hours. When ready to serve, using a hand-held electric mixer, whip the topping heavy cream, confectioner’s sugar, vanilla, and salt until light and airy (try not to over-whip–it’ll look really dry if you overdo it). Scoop whipped cream and spread it over the top of the pie. Sprinkle with chopped REESE’S Milk Chocolate Peanut Butter Eggs. My favorite tradition is hunting for Easter eggs with my kids. I like the Easter basket cupcakes on the Hershey’s site. The Reese’s racers look like fun to make. Those are adorable, aren’t they?! I like the Easter Egg hunt. This year my kids might have to use their snow shovels to find the eggs! My youngest son would really like the Coconut Marshmallow Nests. That pie is amazing. I could dive right into that for breakfast!! My favorite Easter tradition is going to brunch after mass! I Like hosting an Easter egg hunt for my kids and their cousins. I like the Coconut Marshmallow Nests recipe. I love the Chocolate Macaroon Bars! We go to church and then brunch after! The comment about how your parents go crazy with Easter egg hunts for the grandkids cracks me up! My favorite Easter tradition is leaving little Easter goodies for my roommates — which these days is just my husband, but used to be a lot more people! My favorite Easter Tradition is decorating eggs with the kids. My favorite Easter tradition is the Easter egg hunt. I can remember how much fun we had. My favorite easter tradition is dyeing eggs the night before easter! My favorite recipe from the site are the peanut butter bunnycakes! What’s not to love, they are so adorable. My favorite Easter tradition is brunch with the family after church. My favorite Easter tradition is coloring easter eggs with my children! My favorite thing about Easter was that Mom always dyed some eggs without the shell. They made the potato salad and macaroni salad so festive. They also made a colorful egg salad. That sounds incredibly festive! How pretty! My favorite recipe is the Peanut Butter chip Banana muffins/ They are terrific. My favorite Easter tradition is every year we have a HUGE Easter Egg Hunt at my parents house! It’s so much fun because even the adults join in! Ha! The first Easter egg hunt I participated in was when I was an adult with my husband’s family. It is a lot of fun when adults are involved! The Easter Basket Cupcakes are so cute! We go to mass and then have a big brunch. Easter to me is a risen Lord, hope, grace, new dresses for church, glorious flowers and trees (especially the dogwoods), egg hunts, filled baskets, brunches, family, and Southern gals finally adorned in white. I love Hershey’s! 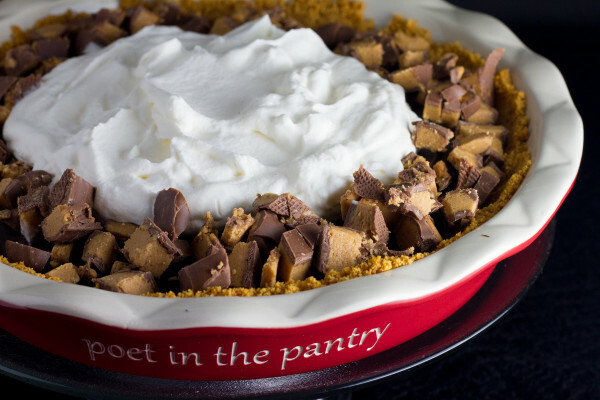 Hershey treats fill the baskets and I love making the peanut butter truffle pie! Every year we make jello eggs! My favorite tradition every year is having all my family over for a big Easter egg hunt!! My favorite Easter tradition is hiding Easter eggs. I would like to make the Sugared Chocolate eggs. The chocolate foil egg wreath is really cute too!! My favorite Easter tradition is eating an entire bag of Reese’s after spending time with friends. I can get behind this tradition! Love it! I started doing an Easter Egg hunt with my son last when he was 2. It will be even more fun this year when he understands a little more and my second son will be old enough to participate. This pie looks amazing though I’m not one much for really rich chocolaty taste. My favorite two Easter candies would be coconut eggs and cadbury creme eggs. My favorite recipe on the website is Chocolate macaroon bars. They sound really good. Church, brunch & Easter Egg Hunt for the kiddos. I want to make the HERSHEY’S Foil Egg Wreath. This looks so good. I want to dive right into a (happy, perfectly portioned 😉 ) slice! My favorite Easter tradition is making an Armenian Easter Bread for our Easter brunch. It makes three loaves and I bake it the day before. So, we always “taste-test” a loaf out of the oven, I mean, we are all about quality control. We try to control ourselves beyond that and save the other two for the next day. It’s not as easy as it sounds! I LOVE those Kisses Macaroon Cookies! That combination of chocolate and coconut make me swoon! 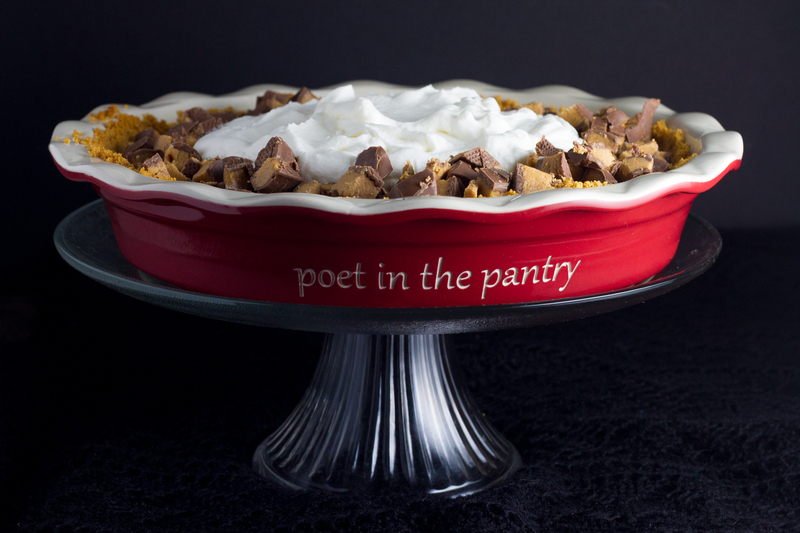 Oh my…I got so caught up, I forgot to tell you…this pie looks outrageously delicious! 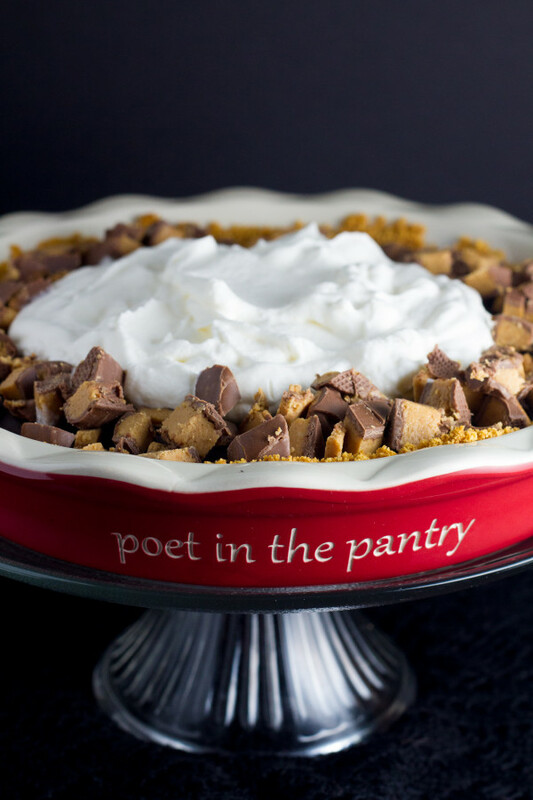 Those Reese’s peanut butter cups are one of my favorites too….this pie looks decadent. I’m pinning now because I know my family would go nuts over this for our Easter brunch! I like the Easter basket cupcake recipe – so cute! Easter baskets are my favorite Easter tradition… Little known fact: My mom spoiled my brother and I with the biggest and best Easter baskets that she enjoyed making them for us well into our twenties, until I had 4 kids… then it wasn’t about “ME” anymore… 😉 I love to pass on the tradition, however! I love the Easter Bunny Egg racers… I might have to try it. However, my son is allergic to PB, so we’ll have to try out another type of egg… perhaps marshmallow eggs? My favorite Easter tradition is reading the Bible with my husband. I also like buying candy the day after Easter for the sales. Easter is about the only time I buy silly candy like eggs or bunnies. is that a tradition? I thought the bunny egg racers were cute. I love attending Church as a family, then enjoying a delicious meal together. It’s also lots of fun to see the kids hunt for Easter eggs. I made the Chocolate Almond Macaroon Bars yesterday and they’re delicious! Ooooh! A trusted source on these–good to know! Love going to church with family and then getting together at grandparents house for a big feast!